Wanderlust Magazine: You've got to applaud Marco Polo's chutzpah to launch 30 new city/island guidebooks into an already pretty crowded market. Aiming to occupy the middle ground between the context-heavy luggage fillers and the context-free thinner volumes, the main USPs of these user-friendly guides are the plentiful 'Insider tips' dotted around each edition, the maps they're packaged with, and the pocket cheering price. Complete with near-magazine style features, they're certainly a less intimidating proposition than some of the big wedges on offer. Mrs Lucinda Culver: Just had a lovely visit to Florence... Your Guide was EXCELLENT! We were directed to special sights and delicious restaurants with an excellent map system! Bravo! Where ever I go in the future I shall pack a Marco Polo! Fully revised and updated and now with new Discovery Tours chapter. It isn't without reason that Florence has been consistently ranked among the world's best cities to visit. Young and old, singles and families, culture buffs and gourmets, fashionistas, shoppers and globetrotters can all have a good time in this sophisticated and atmospheric city. With Marco Polo Florence you'll discover one of the world's great art Meccas. This practical, pocket-sized guide takes you back to the era of the Medici, when the city was home to the world's most renowned artists. You can admire their sculptures and paintings in the city's unique museums and churches, before relaxing in the idyllic gardens of one of its mighty palazzi. The Insider Tips propose a visit to the Market where you can join the Florentines for a stand-up lunch at Nerbone, or to the old Teatro del Sale for a real culinary treat. Panels in each chapter propose things to do if you're on a tight budget and where to pick up some real bargains. 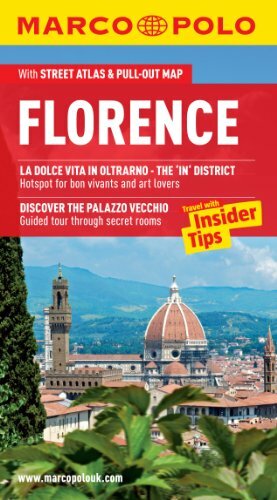 The Best Of pages highlight some unique aspects of Florence, recommend places to go for free, and contain tips for rainy days and where you can relax and chill out. The City Walks guide you through the city along well-known thoroughfares as well as unfamiliar alleys: a bus takes you to some great viewpoints, and when you get to Fiesole the city lies at your feet. Finally the Dos & Don'ts advise to keep calm when looking for a house number and deciding which chic shoes to buy. Marco Polo Florence provides comprehensive coverage of all areas of the city. To help you find your way around there's a detailed street atlas inside, a practical plan of bus routes in the backcover, plus a handy pull-out map. A must-have for all travellers, including those who haven't bought a travel guide in the past. Publicado por Marco Polo Travel Publishing, Ltd.